EVGA's product manager Jacob Freeman, has landed in Taipei ahead of the kick-off of Computex 2017. His first port of call after the lengthy journey was overclocker Kingpin's lab. As you can see in the image below there's something being subjected to extreme cooling, likely being pushed to its absolute limits. So what is obscured beneath the sheet of black cardboard? Thanks to earlier teases from EVGA, and from Kingpin, we are pretty sure it’s the EVGA GeForce GTX 1080 Ti Kingpin Edition. If you skip on over to Vince Lucido's (AKA Kingpin's) Facebook page, for example you can see a couple of pretty clear partial reveals of what is surely the Kingpin Edition of Nvidia's latest and greatest consumer graphics card. One image is accompanied by the description "High efficiency next gen KP power design, Pascal OC perfection." Check it out below. 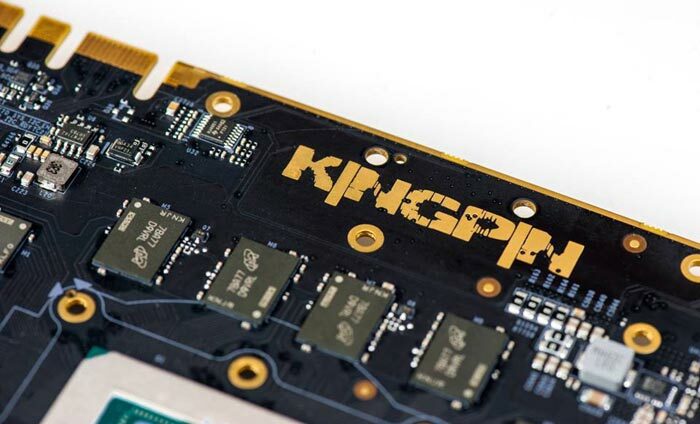 With a top-end Kingpin graphics card, as teased above, we expect to see the following; EVGA's iCX technology, high grade semiconductor components that are specially selected for the rigours of LN2 overclocking, support for external OC modules, and more. For example OC-enthusiast targeted hardware refinements check out the previous custom Kingpin card based upon the GTX 980 Ti. 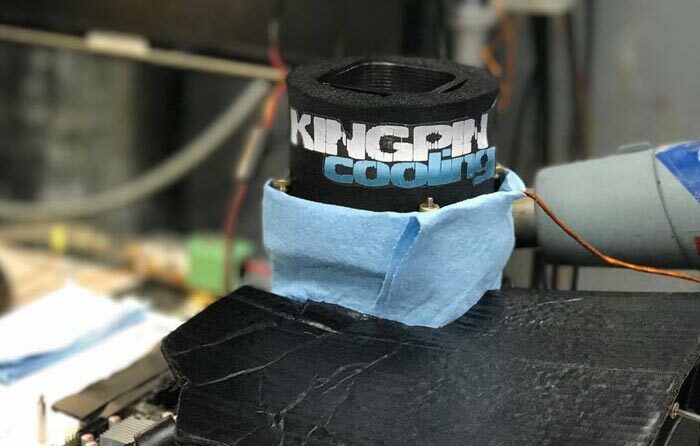 In March Kingpin broke 3DMark Time Spy records using an Nvidia GeForce GTX 1080 Ti OCed beyond 2.5GHz on LN2 (shortly before breaking 3GHz - see that article's comments). With a new custom designed card who knows what will be possible. Hopefully, we will see and hear more about this top end EVGA graphics card at Computex.